– Will’s FIRST booster seat was a bargain at the local grocery store! Don’t worry, he meets the weight requirement and this car seat is approved by the German government. Best of all, this sleek little number is much easier to manage in our two-door coupe. Will’s plush, beautiful car seat didn’t leave enough room for his feet (behind Brice’s seat) or anyone else’s rear end in the back seat with him. Will is quite proud and we are quite relieved! 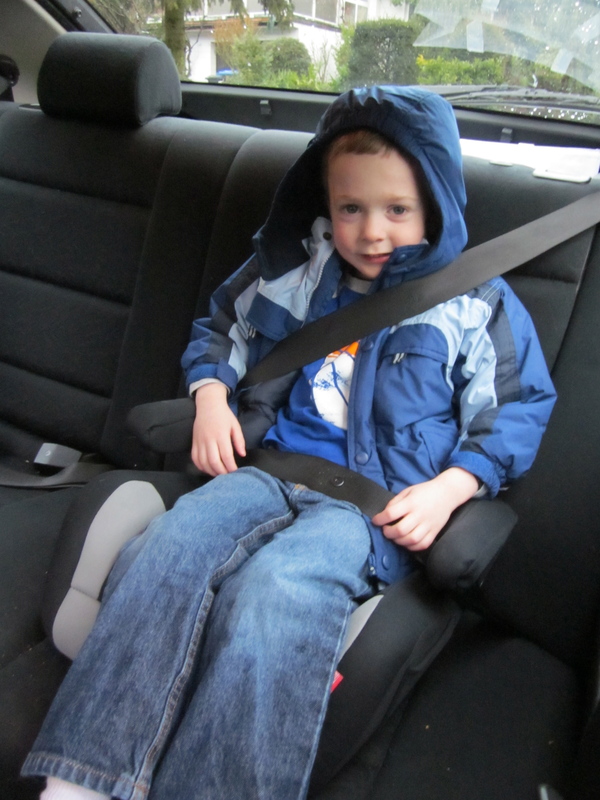 Will is sittin' pretty in his new booster seat! 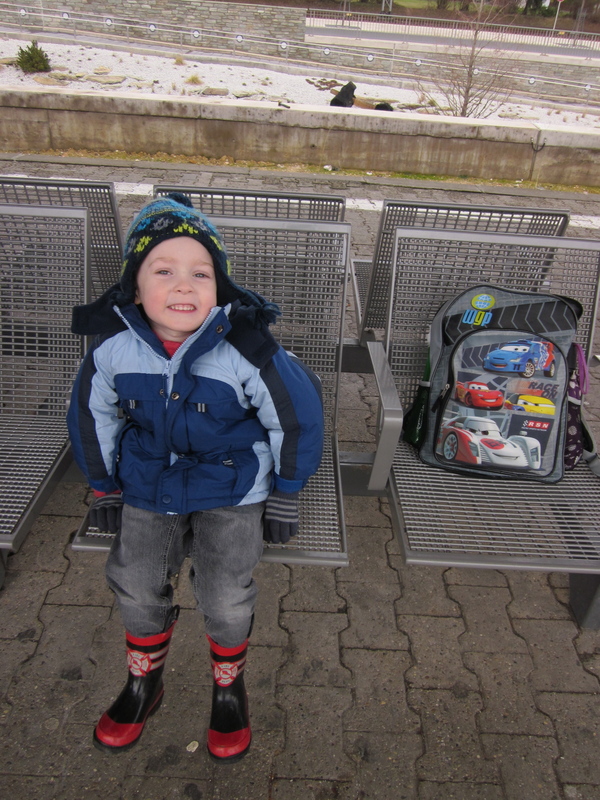 – Our FIRST family train ride, to downtown Frankfurt, was documented in an earlier blog post. Here is a picture of Brice and Will, ready to leave our apartment building on that day. Leaving for our first family train ride! – During that first family visit to downtown Frankfurt, I saw a dog in a mall for the FIRST time. This was not a service dog! It was just someone’s pet, walking on a leash … in the mall. I saw two different dogs in the mall that day. – I did laundry in the basement for the FIRST time – there’s a laundry room where all tenants in our building keep their washers/dryers. I found laundry soap, but there wasn’t a dryer (nor was there fabric softener) for a few weeks. It was my FIRST time line-drying every bit of our laundry! There’s a warm “drying room” in the basement with clothes lines for all to use. Our clothes were a bit crunchy those first two weeks, but it was no big deal! – Our FIRST snow in Germany was on a Saturday morning. Brice took Will outside while I read and drank coffee (5,000 bonus points for Daddy). Will loved throwing snowballs at Brice – hilarious! They walked downtown on the walking path and discovered the Saturday market. Will walks in our FIRST snow. 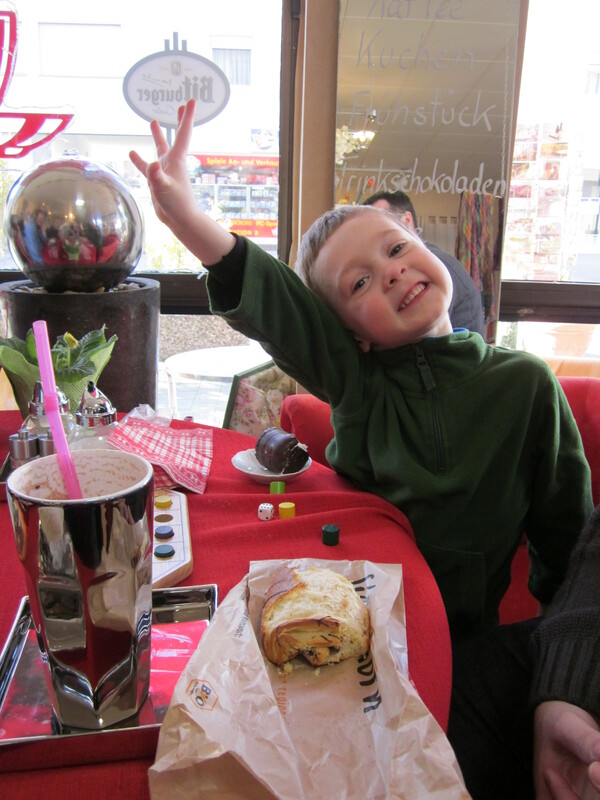 – Will’s FIRST play date in Germany was in the nearby town of Neu Anspach. Will and I set out on their own, making five train transfers during the total trip … and we survived! Our new friend from church and her son were excellent hosts, and we had a great time. Here’s Will at the train station (waiting for our last connection) on our way home. Will waits for the train, eager for his FIRST play date in Germany! 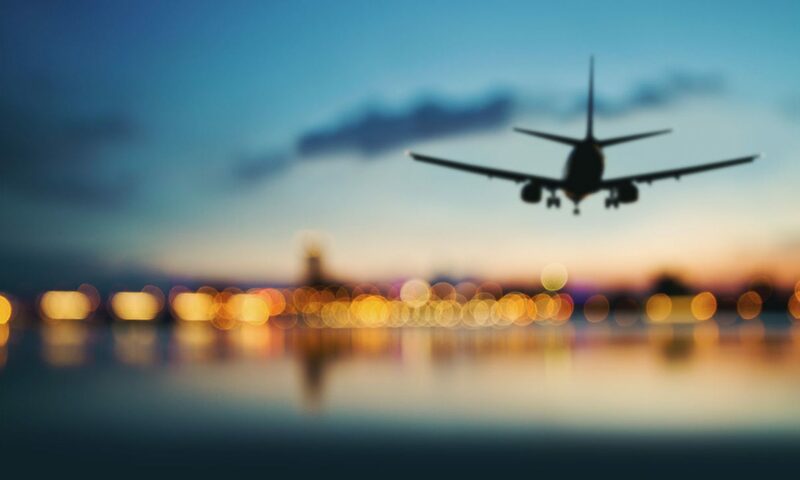 – I survived my FIRST time driving our car in Germany. Did I mention that our car is a stick shift? Special thanks to my Dad for teaching me to drive one at the age of 16. I think I impressed Brice, who didn’t know I could drive a stick. I drove to the grocery store … then I killed the car on the way home. Boo! In my defense, it’s also really hard to tell whether you’re in first gear or third, and nothing lights up to show you. So, you think you’re in first gear (after waiting at a stop light) and you prepare to go, but … something’s wrong … awww shoot – you’re in third. Seriously, come drive the car and you’ll see! I know we’ll learn to “feel it” a little better as time goes on. I’m just glad that I can get myself to the grocery store and back! – The FIRST Kindergarten we visited seemed absolutely fantastic. We put Will on a waiting list, visited another place a few days later, and then the FIRST place called with a spot for Will! We were told there wasn’t much of a chance of getting him into that school before summer, so this is truly exciting! He starts in a few weeks. 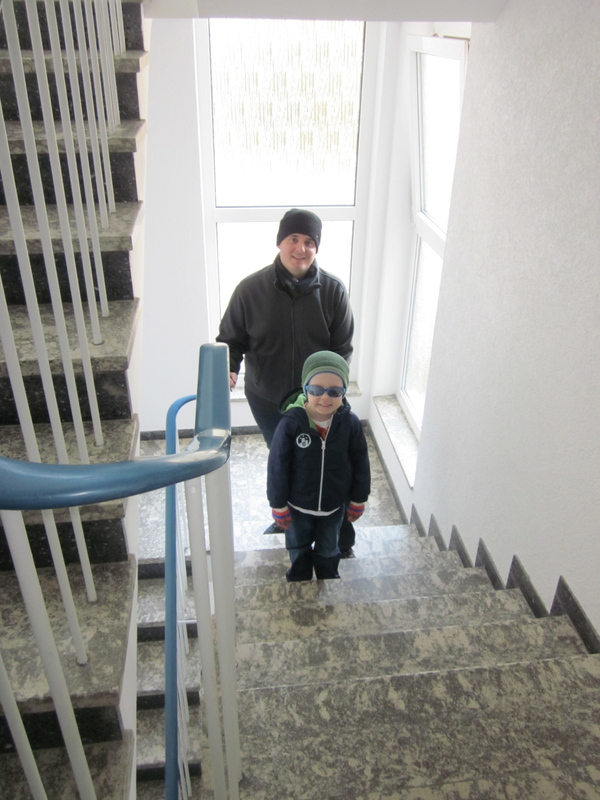 Will (and Mommy and Daddy) loved the FIRST Kindergarten we visited! 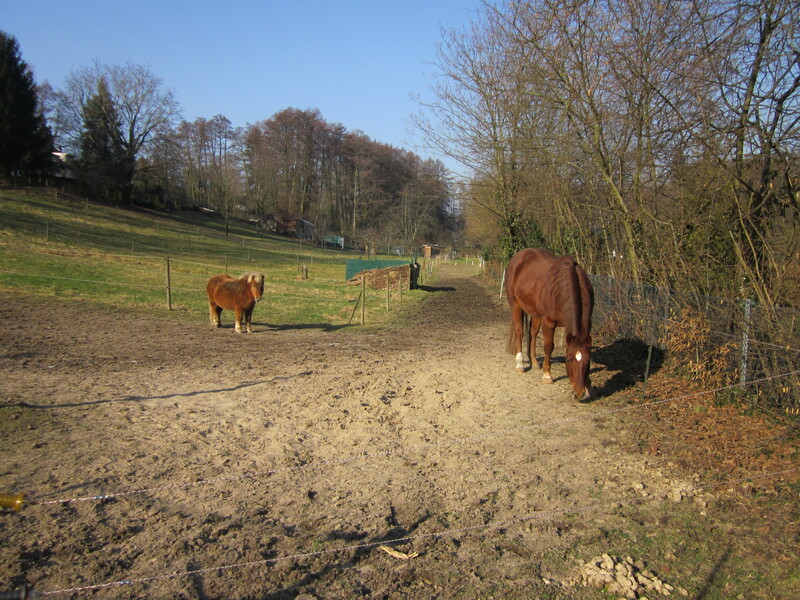 – Our FIRST road trip in Germany was excellent! Brice drove us to Dusseldorf, about two hours away, to visit another Youth Compass family. We hope to spend lots of time with them in the future! Thanks to the Colemans for delicious food, comfy and cute accommodations, great conversation, and lots of fun play time for Will! 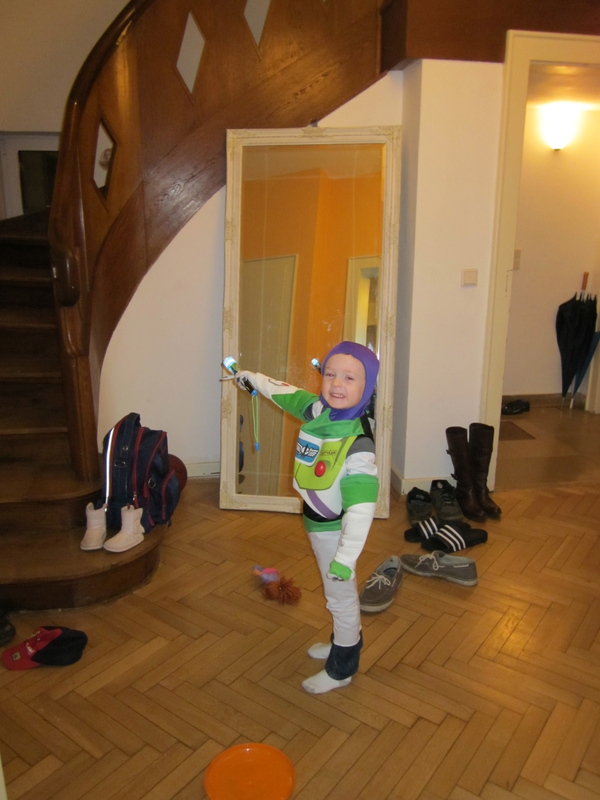 One of the many reasons we had a great time with the Colemans in Dusseldorf! 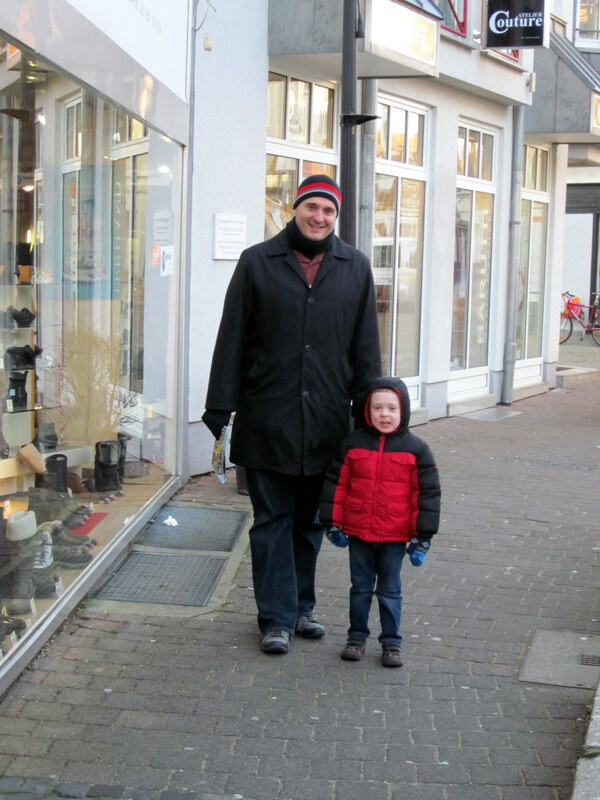 – We decided to give Will his FIRST cathedral visit on the way home from Dusseldorf. 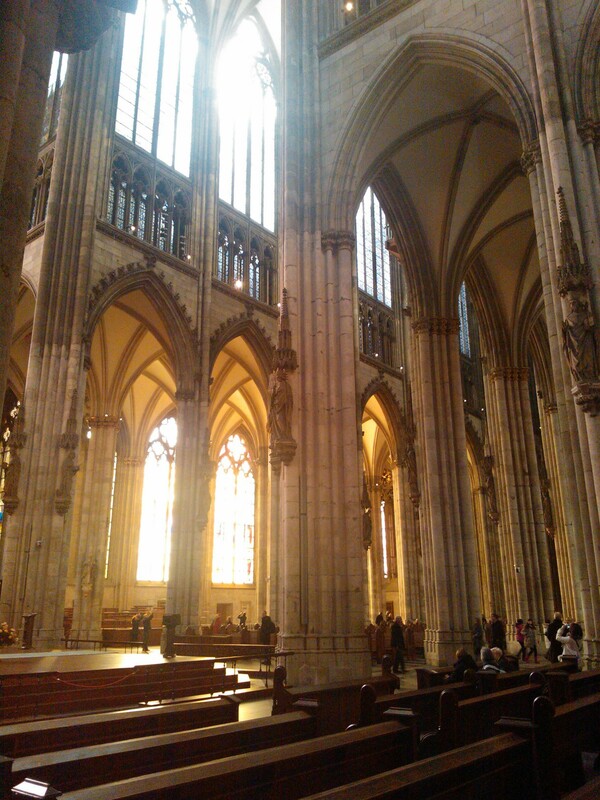 We drove into nearby Cologne (Koln) – thank goodness for the GPS – and toured the famous Cathedral. Will was very interested in the stained glass windows depicting familiar Bible characters and stories. It was truly beautiful. Two thumbs up for spontaneity! 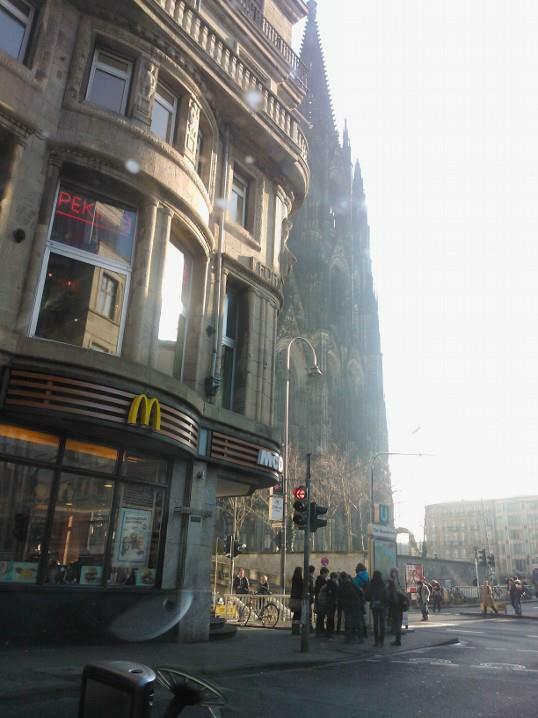 – Will got his FIRST taste of a German McDonalds across from the Cathedral in Koln. Can I just say that the customer service there was fantastic? Seriously, we need to call and give the man who helped us a glowing review. He was so helpful and kind, and his English was fantastic (although he apologized for it a couple of times). Also, why don’t all McDonalds locations have curry sauce for their nuggets/fries? Oh yeah … so Julie can stay in the same size jeans. I don’t even like French fries, but that sauce was GOOD. Yes, that's a McDonalds right next to the Cathedral. – When you are very cold and have a long car ride ahead, you just need a little pick-me-up. 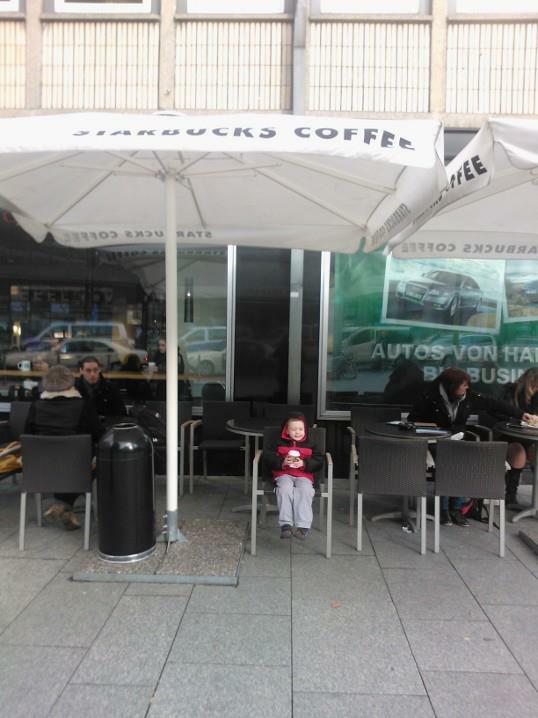 ‘Twas the perfect time to experience our FIRST German Starbucks. Will sipped a hot cocoa, I had a caramel macchiato, and Brice ordered a mocha. Ahhhhh. 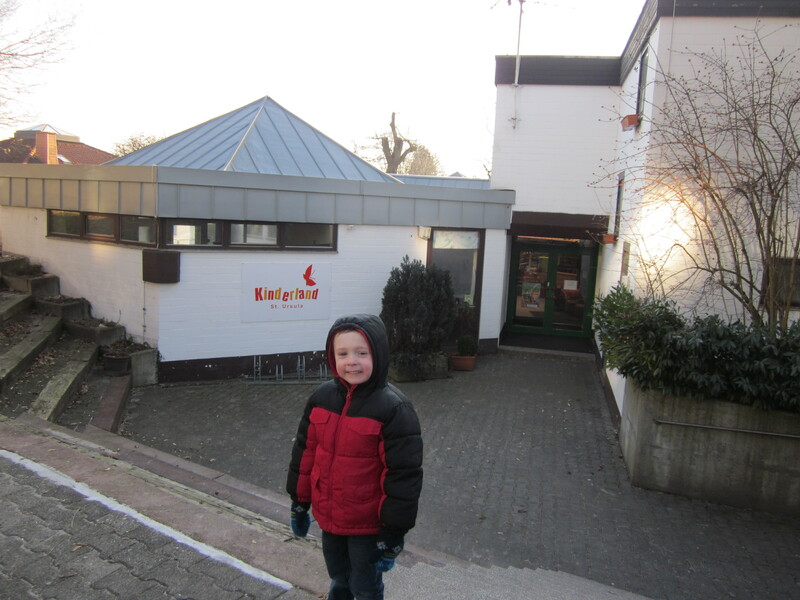 – Our FIRST experience at a German school was an “Open House” at Marion’s daughter’s school in Neu Anspach. Her daughter performed with a school singing group, and most of you know that’s right up my alley! We watched the performance, toured the school, spent time with Marion and her kids at their home, and enjoyed a delicious lunch of homemade Kartoffelpuffe (our FIRST — served with Apfelmuss and Mirabelmuss from Marion’s garden) and scrumptious cake and coffee. 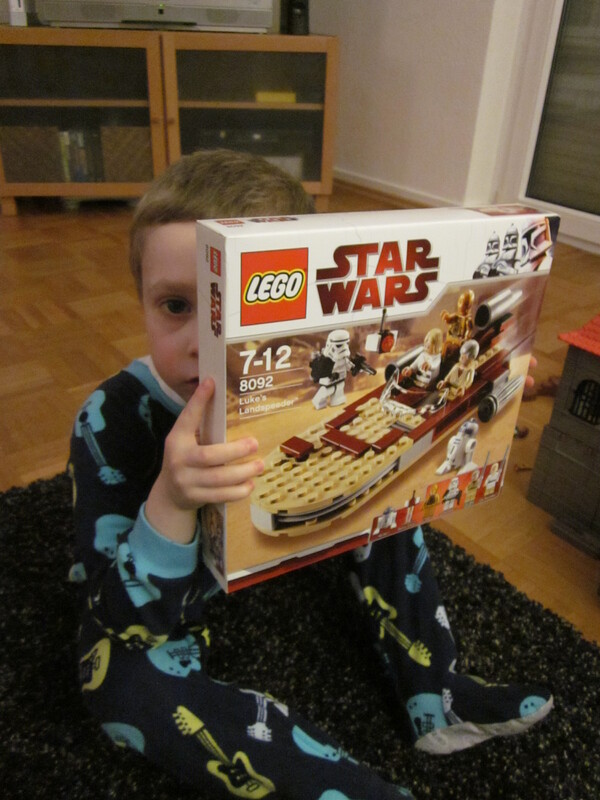 Will had a blast playing with Marion’s son’s Star Wars LEGO collection. Yes, a 14-year-old let a 4-year-old play with his toys! Glorious. I also played piano for the FIRST time in a month … and it was the first time I’d played “classical” piano in years!!! I’m excited to brush up on my rusty skills. I’m accompanying Marion at a church event this weekend – she is a wonderful flautist. – During Brice’s FIRST trip to Brussels, I had my FIRST driving experience on the Autobahn. Where did I drive, you ask? Why, IKEA, of course! Again, thank goodness for the GPS … and the fact that IKEA is right off of the Autobahn exit. … Brice pulled a child from an icy stream for the FIRST time. 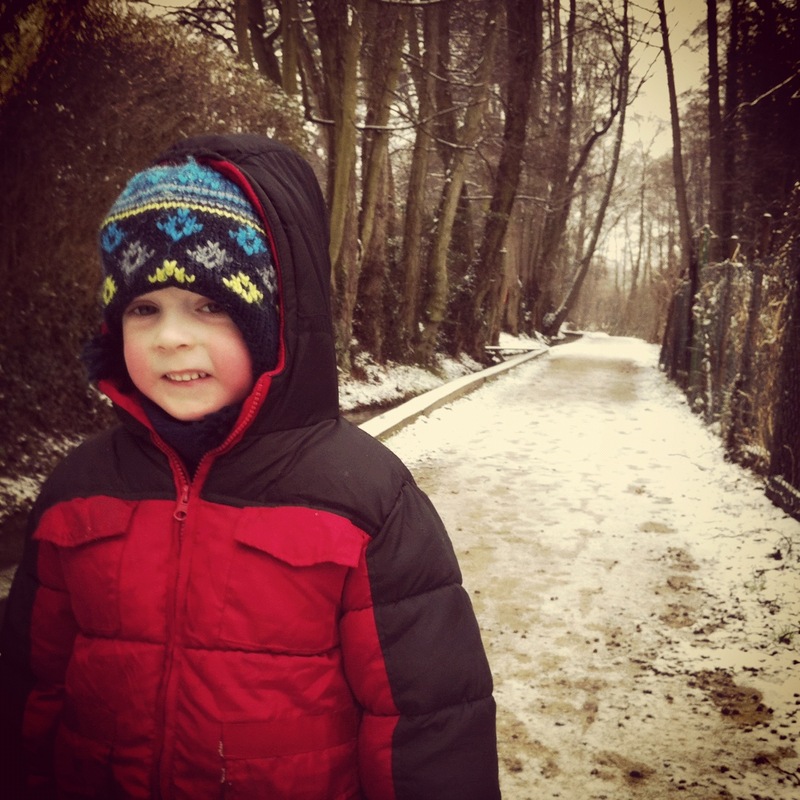 The stream wasn’t as frozen as the boy thought! He was right next to the back gate of a house (his, we hope) and he had a friend with him, thank goodness. He sat there, stunned, after falling in (the water wasn’t very deep). Brice pulled him out and asked “Are you OK?” He didn’t seem to speak any English. He swore in German (I think), stood up, and started crying. His friend encouraged him to walk inside the gate. I’m not sure his friend would have been able to pull him out without falling in himself, so I’m very glad we were walking by them at that very moment! – Last week we received our FIRST package that wasn’t something we ordered or mailed to ourselves! How exciting!!! Thanks to Holly, Brian, and Cooper Johnson for the absolutely perfect kitchen towels/rags, goodies, and Valentine’s Day love. We are so blessed by you! 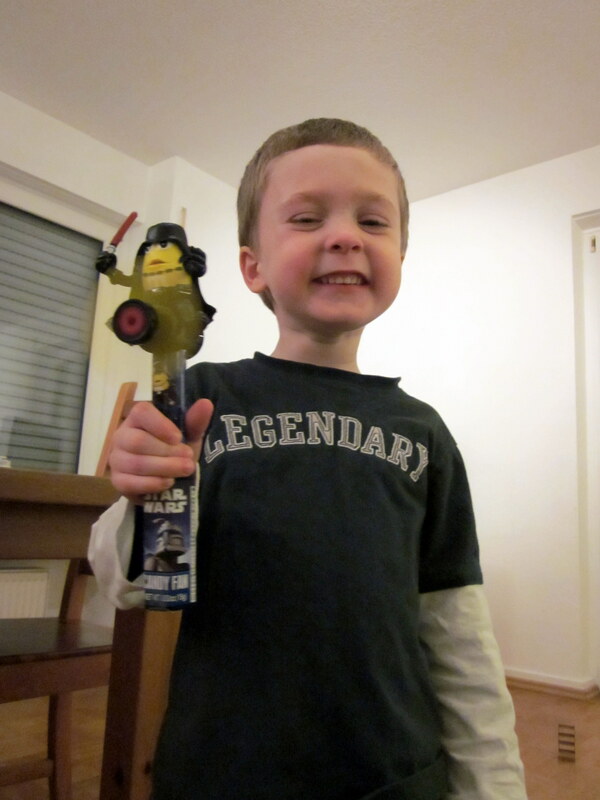 – Will earned a toy reward and of course chose a Star Wars LEGO set – his FIRST in Germany! I think his Daddy helped him choose … this particular set is really cool (and new) and was on sale (!!!) at Real. – Our fantastic upstairs neighbors took us on a local excursion a few days ago: the Saturday market, our FIRST trip to the Oberursel library, a Turkish grocery store (where he bought us fresh parsley & dill), their favorite coffee shop (where Will had his first Schokokuss), and our FIRST bus ride – they have annual bus passes and can take guests on weekends. Hooray for friendly neighbors who want to show us around town! Out and about with the neighbors! 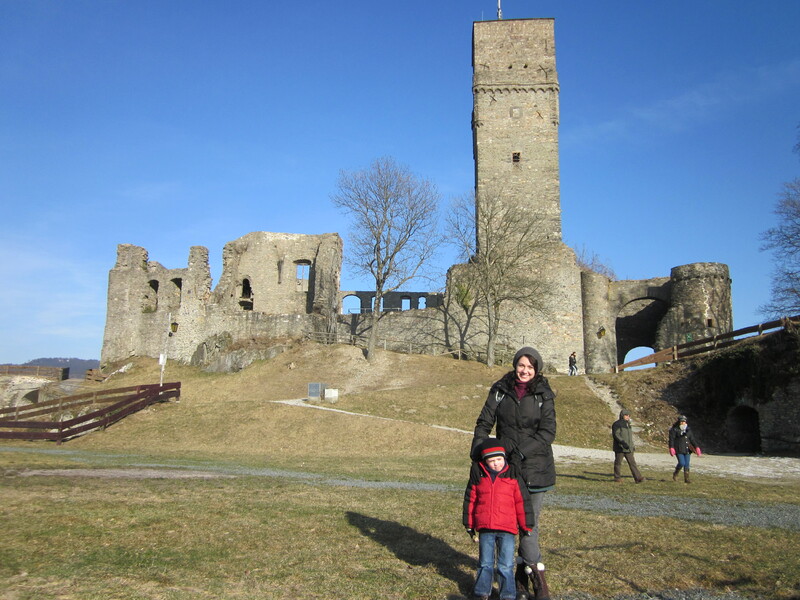 – Our FIRST family castle visit was a huge hit – we are planning an entire blog post about this! Here’s a preview. – You’re going to think I’m making this one up, but … today was my FIRST time seeing a monkey (wearing a diaper) on a man’s shoulder. They were just walking around town. Hello … you have a monkey on your back. Literally. Wow! That IS a lot of FIRSTS! Good job to Brice on your life saving efforts! So glad you were there at that precise moment! There are no coincidents in God’s world, I believe! I can’t believe how much Will has appeared to grow up in just one month! Oh, and GREAT job on driving a stick, Julie! Each one seems different, so you will definitely get used to the one in your car very shortly, I’m sure. I look forward to your next up-date and pictures, especially the castles. Jim has seen some of the castles in Germany when he was a little kid so if you happen upon any of the same ones, he might recognize them. So cool! This was so cool to read. I love the adventure God is giving to you all. I’m super excited to share the castles post with our boys. The Bangsund Boys love castles. 🙂 We love you all very much! Hey, love it guys. It was fun to be in Germany this past week and connect with you guys. 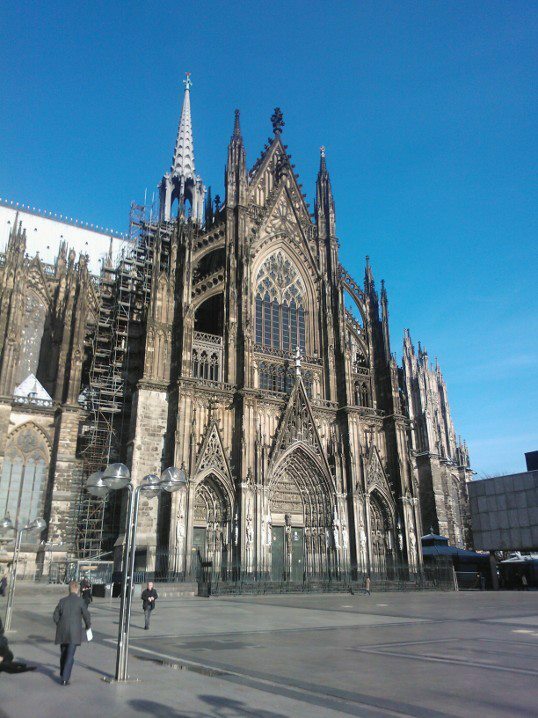 Your pics make me want to get back there and see Koln, for sure. Keep the updates comin’!! Previous PostPrevious To Brussels and back in 22 easy steps, a photo essay. Next PostNext A month on the ground! Investing in the community.